There is an invisible army of people deep inside the world's biggest and best-known companies, pushing for safer and more responsible practices. They are trying to prevent the next Rana Plaza factory collapse, the next Deepwater Horizon explosion, the next Foxconn labor abuses. Obviously, they don't always succeed. Christine Bader is one of those people. She worked for and loved BP and then-CEO John Browne's lofty rhetoric on climate change and human rights--until a string of fatal BP accidents, Browne's abrupt resignation under a cloud of scandal, and the start of Tony Hayward's tenure as chief executive, which would end with the Deepwater Horizon disaster. Bader's story of working deep inside the belly of the beast is unique in its details, but not in its themes: of feeling like an outsider both inside the company (accused of being a closet activist) and out (assumed to be a corporate shill); of getting mixed messages from senior management; of being frustrated with corporate life but committed to pushing for change from within. The Evolution of a Corporate Idealist: When Girl Meets Oil is based on Bader's experience with BP and then with a United Nations effort to prevent and address human rights abuses linked to business. 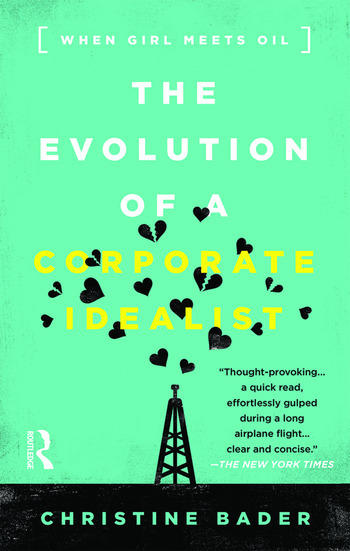 Using her story as its skeleton, Bader weaves in the stories of other "Corporate Idealists" working inside some of the world's biggest and best-known companies. Christine Bader is a sought-after speaker, lecturer, and advisor on corporate responsibility. She is a Human Rights Advisor to BSR and a Member of the Council on Foreign Relations. She serves on the boards of the Business & Human Rights Resource Centre and The OpEd Project. Her work with BP from 1999 until 2008 brought her to Indonesia, China, and the U.K., managing the social impacts of some of the company?s largest projects in the developing world. Christine has published numerous op-eds and articles and given talks to conferences, companies, and universities around the world, including a TEDx talk entitled Manifesto for the Corporate Idealist.? She lives in her native New York City with her husband and two children.